Two veteran rally racers have announced they will team up to campaign in the 2017 Dakar Rally to be held Jan 2 through 14 in South America. 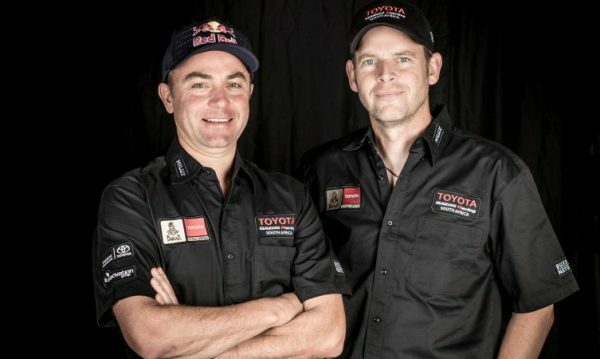 With such an iconic race, reserved for the elite and moneyed set of global rally competitors, the likes of Nasser Al-Attiyah and Giniel De Villiers together make for fine company in the Toyota Hilux Evo they plan to drive in the contest. To keep with the legendary element of the storied race, both men bring gravitas. Al-Attiyah is a Qatari rally driver and sport shooter. He won the Production World Rally Championship in 2006. He won the Dakar Rally for the first time in 2011 and again in 2015. In shooting, he came in fourth place in the 2004 Olympic Games in clay pigeon shooting and 15th overall in the 2008 Olympic Games. And in the 2012 Olympics Games he won the bronze medal. Why did we include the shooting? You have to ask? De Villiers, from South Africa, won the 2009 Dakar Rally. He started out his career as a track racer, and he also has four South African Touring Car titles, three of which he took consecutively from 1997 to 1999. At the 2014 Dakar, he went for the win and claimed four podium finishes throughout the 13 stages, which included a win in the final stage in Valparaiso. Next, he finished the rally in fourth place overall. In 2015, he came close, with a runner-up position and remained in great shape the following year, taking third place on the podium in 2016. So, now, for anyone who follows Dakar, this pair should be a good one to watch.